Moroccan food is very hot right now in the US... I was told by a food blogger in Australia that is really popular there too... I'm not surprised; genuine Mediterranean cuisines have been riding the wave of fresh and clean cooking for the last few years. 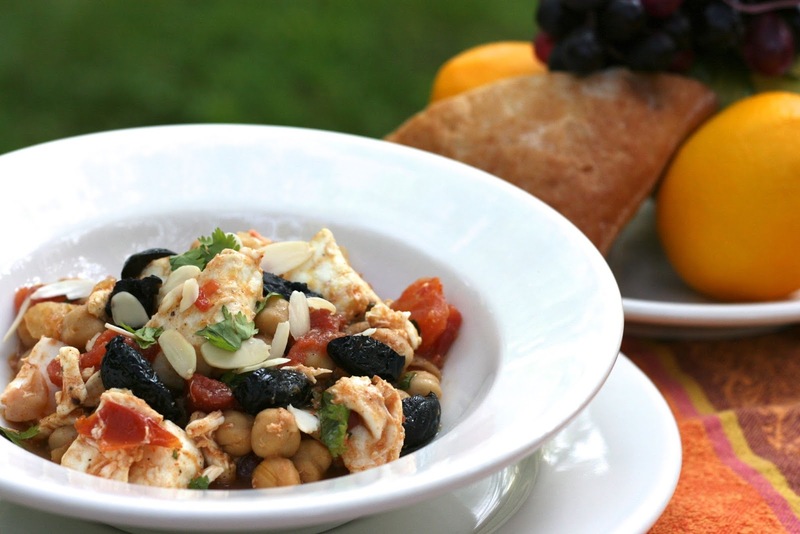 Moroccan cooking has all of the freshness of other Mediterranean styles of cooking with the added exotic pinch of African and dash of Indian flavoring that just makes this food super intriguing. Bloggers Around the World have landed in this captivating land of genie lamps and magic carpets.... here are a few simple Moroccan inspired dishes to wet your appetite for this mysterious place. 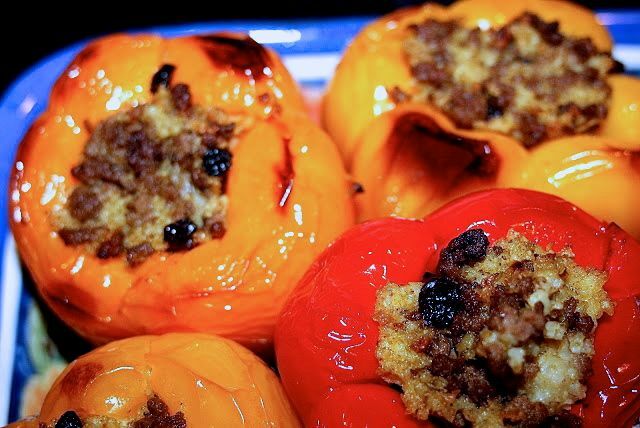 Theses peppers are stuffed with beef and millet and seasoned with the Moroccan spice mix called: Ras El Hanout which is primarily a mixture of: cinnamon, cumin, coriander, ginger, cardamon, pepper and turmeric... but every family has it's secret blend. 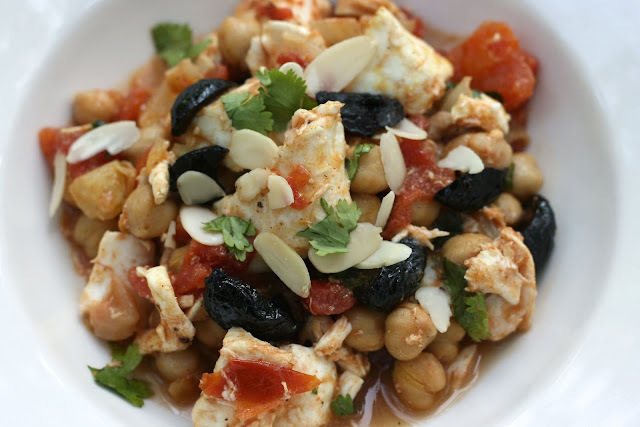 I use this mix in my recipes because it simplifies the ingredient list adding a Moroccan flavor with out a lot of work. Tagine cooking is very common in Morocco. It is a clay vessel similar to a Dutch oven used to slowly steam and cook mostly stews. The pots are very attractive too. This chicken dish highlights the more African flavoring found in this region. I hadn't cooked a Moroccan fish dish yet, so I looked at many fish stew recipes and came up with this simple one. I love how this tastes like it has been simmering for hours, even thought it is quickly mixed on the stove. 1) Heat the olive oil on medium high heat in a large skillet. Saute the onions when they start to get soft add the Moroccan seasoning, cayenne pepper and garlic in order to bloom these spices about 1 minute. Do not brown the garlic. 2) Add fish mix with spices and cook for 1 to 2 minutes. You do not want to cook it through yet. 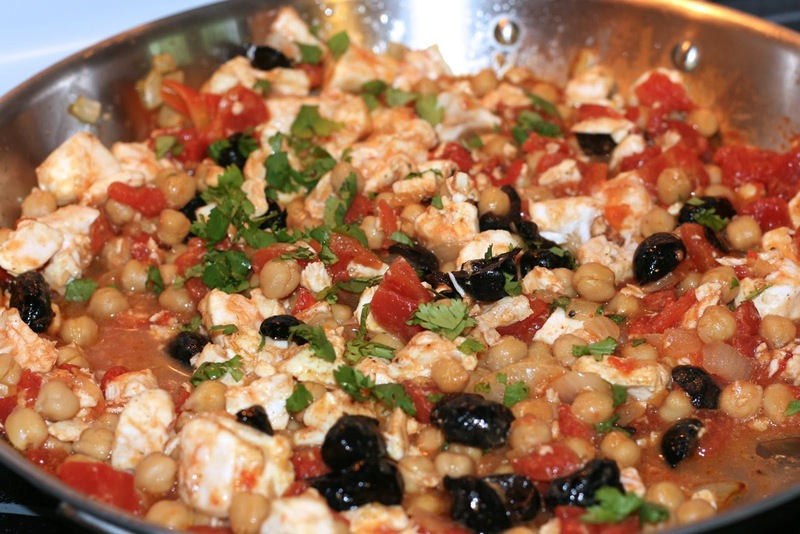 3) Add chickpeas, olives and tomatoes heat through. 4) Add cilantro and check salt and pepper to taste. 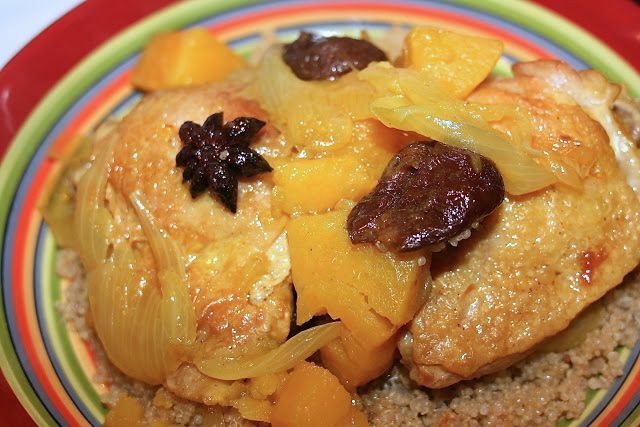 Serve over couscous or with rustic bread. 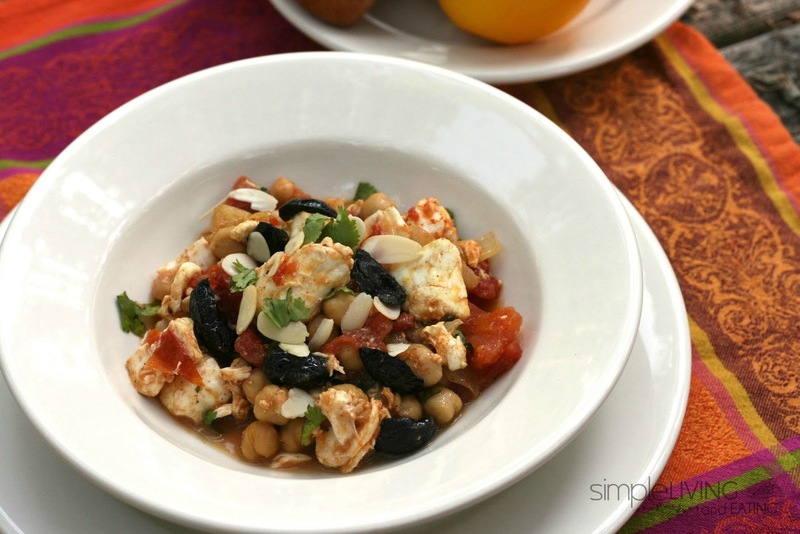 On July 13th be sure to visit Cooking Around the World to see what my fellow travelers are cooking up from Morocco. I've been to Morocco many, many years ago and among other things I loved their kitchen! Delicious food gallery! I'm so jealous... I would love to visit Morocco. I already love the food. Once more you delight us with a good looking and delicious overview. The fish stew sounds really good and fresh. Thank you very much for taking part in Bloggers Around the World. Good to have you on board. Thank you so much Christian a compliment from you means a lot. I am so glad I found your group. Thanks Ann, and this is easy to through together.